Workspace takes us inside the creative spaces of some very creative people. 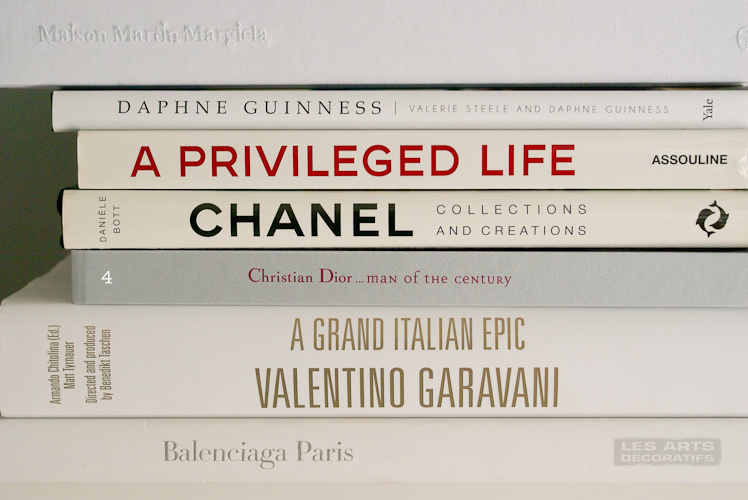 Daphne Guinness quoted her in her book(!). Still, Anya Georgijevic maintains she is not an It Girl. She does, however, maintain the blog I’m the It Girl, plus, she’s western editor of FLARE, a fellow editor at Vitamin Daily, and has a dog with lopsided ears (the best kind). 1. My glossy cream desk is by a Minneapolis-based design firm, Blu Dot. I love its minimal, crisp design, although most of time, it’s in a state of complete mess. Next to my laptop is whatever I’m working on at the moment. Today it’s FLARE, but often it’s a slew of beauty products waiting to be reviewed. 2. My monogrammed Castelli notebook was a gift from my Vitamin Daily publishers, and I jot down all my notes in it, exclusively with my trusty Muji pen, which I stock up on whenever I go to New York or Hong Kong. 3. I can’t work without music or some type of background noise (sometimes I play stylish films for inspiration — see the “Screen Style” posts on my blog) and sound doesn’t get better or chicer than with Harman Kardon speakers. Whenever I get stressed, I indulge in some aroma therapy. Currently on the menu: Laduree. My dog Bun is my office mate, so he demanded that his picture be included. 4. Above my desk is where I keep my essential literature. Whenever I feel uninspired, books are my place to go. 5. 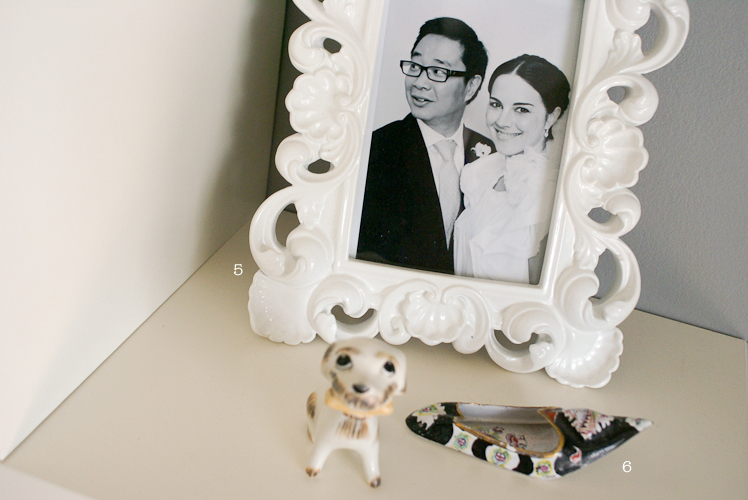 This frame is the girliest thing I own and holds a picture from my wedding. 6. The two ceramic figures are from my two grandmothers. I loved this silly-looking dog as a kid and I always used to play with the little Turkish shoe (sometimes to my grandma’s annoyance). Now I’m a dog person that owns a lot of shoes, so…thanks. P.S. Click your way over to Anya’s blog I’m the It Girl, where if you’re lucky she’s writing about Cher’s Clueless style. P.P.S. Check out the first post in the Workspace column, Niki Blasina of A Haute Mess, and find out how she smells when she works. Love this new series! 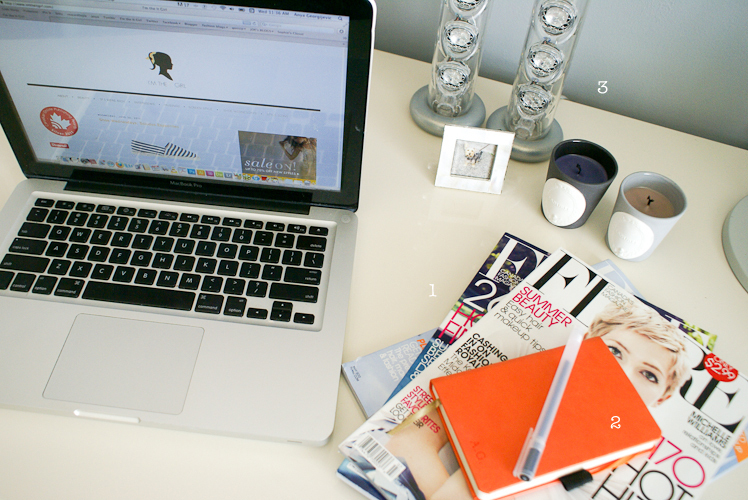 It’s so great to see behind-the-scenes of some of my favourite blogs! I am in love with Anya’s desk. The notebook is available at Make in Granville Island. They can monogrammed them there too! This blog is new to me! Anya is gorgeous! Love surfing her blog and catching up on her posts! thx! I am loving the workspace features – I want more. Brilliance! Lovely desk, the frame goes perfectly with it. Really like these workspace features – I’m always curious what other people’s workplaces look like, so yeah, I can get my fill here for sure ;-) Looking forward to see who’s next! i love this workspace post! Petite Adventures — It’s a treat for me too! Sophia — Good to know! Thanks! Shannon — She’s a stunner, isn’t she? Jo — Hooray! There are more coming up! Sofia — So girly and so gorgeous! Leonie — So happy to hear that! Koko — The shots are stunning, aren’t they? This is probably the closest to mine, except Anya’s is so much more….cool. Love it!